The stocky Korean made his mark from the very start to end Day 1 with a 2 minute 54 second margin over the top-seeded Manoch. Ryu then capped his runs with victories in the two special stages on Day 2. Manoch made a last ditch charge in his Honda CRF 450 in the MX stage where he shaved off nearly 4 minutes from Ryu’s lead but his effort came a tad short to swing the outcome of the race in his favor. Thailand’s Thangsook Sooksirisaiysorn in a Suzuki RMX250 settled for third place finishing nearly 12 minutes behind Manoch. 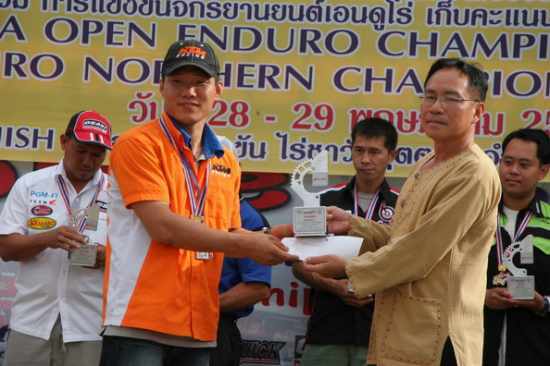 Ryu Mung Gul receiving the first place trophy in the ED1 category of the FIM Asia Enduro Championship held in Chiangrai, Thailand on May 28-29. Over 70 riders from Thailand, Korea, Australia and the Philippines participated in the second leg of Asia’s premiere endure event to dispute individual and team honors in the ED1, ED2, ED3 and ED4 categories. The participants and FMSCT officials pose for a "class photo" prior to the start of the race. FIM Asia President Stephan Carapiet congratulated the winners and the FMSCT who organized the event. “On behalf of the all the member FMNs and the FIM Asia Board of Directors, I congratulate the FMSCT for staging a successful event,” he said. “Likewise, allow me to congratulate all the winners with special mention of Mr. Ryu Myung–Gul of Korea for bagging first place in the ED1 category. Mr. Ryu’s victory is paving the way for an exciting wind-up of the Asian Enduro series in Mae Horn Song in July,” he added. The local riders dominated the other categories with Somphetd Inthawaree, Nuttapon Potaton and Kristsada Boonwatee taking respective 1st , 2nd and 3rd places in the ED2 class, Nattapong Sinsan, Rachata Leka and Jadsada Jantapoon in ED3 and Adepong Kaenpaead, Wanmongkol Yaboonna and Watchara Jantakool in ED4. Philippine rider Marcelino Andres finished 8th overall in the ED3 category after losing his bearings in one of the special stages. Korea’s Heo Moon Bun suffered a similar fate to finish 13th in the class. 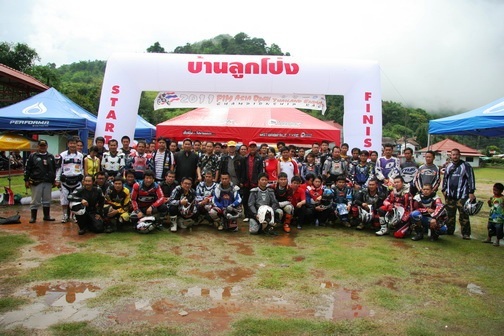 The 3rd and final round of the FIM Asia Enduro Championship will be held on July 23-24 in Mae Horn Song, Thailand. For more information on the FIM Asia Enduro Championship and other FIM Asia events and activities, please visit www.asiamx.org and www.fimasia.org. The winners in the different categories pose with FMSCT race officials and promoters. FMSCT officials pose with Philippine Enduro Commission Director Carlo Antonio Garcia (center) who was appointed a jury member of the event.